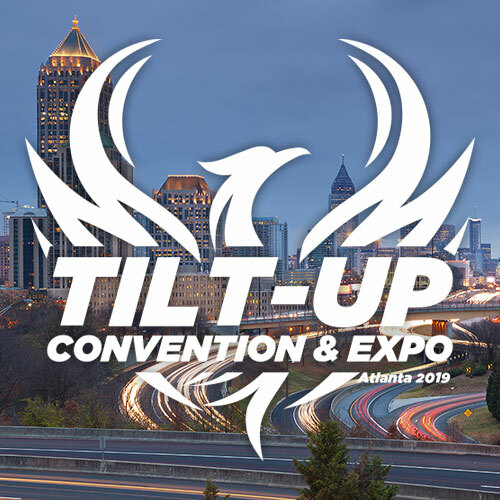 The Tilt-Up Concrete Association has recently engaged in advocacy efforts to champion expanded market adoption and acceptance of partially composite insulated sandwich wall panels. While not a new invention, these panels are experiencing a surge in demand due to their numerous advantages over other systems. The popularity of these panels is fueled by changes to the application of the International Energy Conservation Code, primarily the continuous insulation requirement coupled with the geographic expansion of the insulation value requirements. The surge in demand is being met with some hesitation from important industry adopters, which could suppress the technology’s ultimate impact and market scale. A call for action on this issue has come from the tilt-up engineering community members. They desire to make more transparent and accessible the way these panels are analyzed, how they are designed and, ultimately, how they perform in the real world. 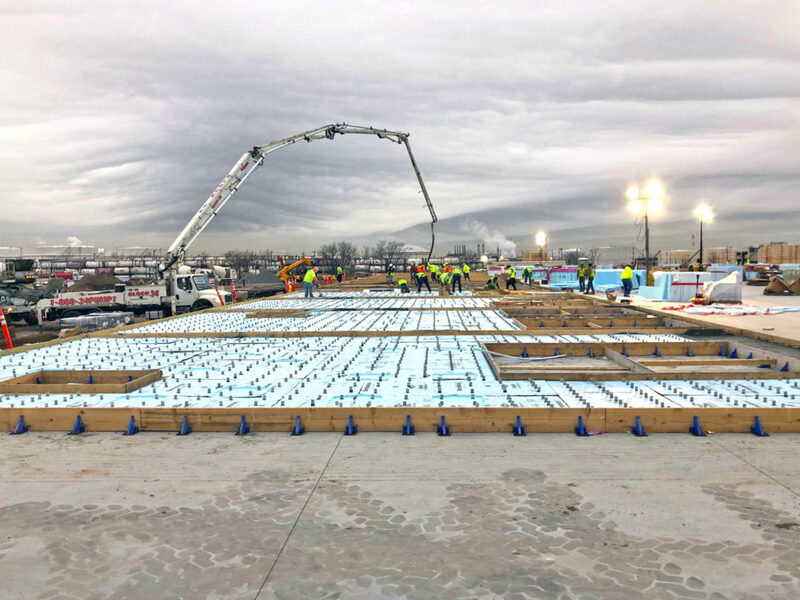 The subject has been discussed for multiple years at meetings of the American Concrete Institute’s committee on tilt-up concrete (ACI 551), as well as by the Tilt-Up Concrete Association board of directors. The topic has also been the subject of multiple talks at the International Tilt-Up Convention and Expo over the past two years. In response to the growing interest in a defined understanding of the behavior and confidence in global design predictability, the TCA has formed a special task group. The TCA Engineering Task Group on Partially Composite Sandwich Panels, meeting in conjunction with the fall ACI convention last year, has come to a consensus on, one, the need for a better understanding of the behavior of these systems and their components; two, the type of research that should be conducted; and three, an outline for a unified approach to the design of said systems. There is tremendous overlap between ACI 551 and the TCA’s Engineering Task Group on Partially Composite Sandwich Panels. The task group anticipates working very closely with ACI 551 on the application of this effort to the existing concrete code. Andrew McPherson (Seretta Construction, Orlando, Florida), the current chair of ACI 551 and past president of the TCA’s board of directors, will serve as chair for the TCA task group. He will be supported by Philip Kopf, PE, FTCA (The Kopf Consulting Group Inc., Marietta, Georgia), who will serve as the technical chair. The task group has received a proposal from Marc Maguire, PhD, with Utah State University, outlining in detail a plan to develop the data and tools necessary to support the TCA task group’s objectives. WHAT ARE PARTIALLY COMPOSITE SANDWICH PANELS AND WHAT ARE THE BENEFITS? 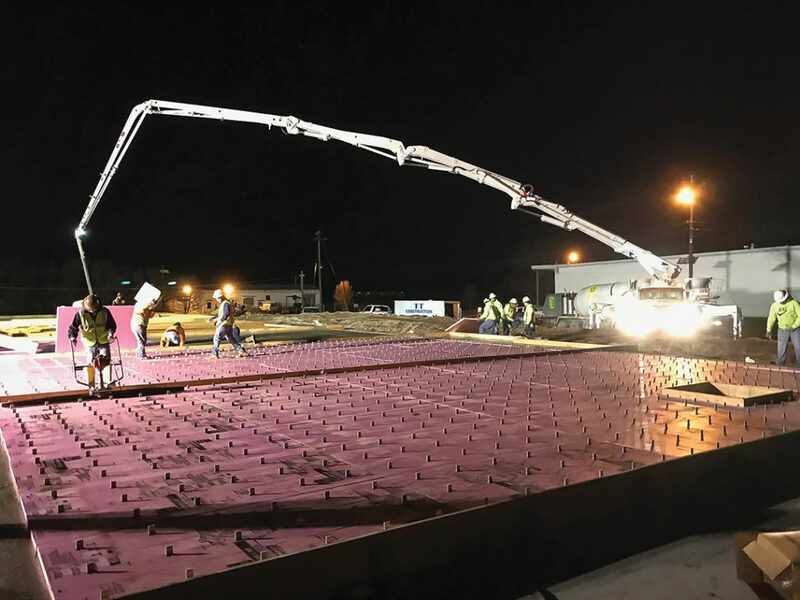 Traditional insulated non-composite tilt-up concrete sandwich wall panels are composed of a thin (architectural) concrete wythe on the exterior, a layer of insulation, and a thicker (structural) concrete wythe on the interior. The layers are held together with nonconductive connectors of varying geometry and performance specifications. In this application, the connectors transfer the vertical and horizontal load of the façade back to the structural wythe. Only the interior structural concrete wythe is made to resist structural loads. Partially composite sandwich panels differ in that both wythes of concrete are meant to contribute to the panel’s load-bearing capacity and force resistance. This is accomplished by a more complex and robust connector design between the wythes that facilitates the transfer of loads back and forth across the insulation medium separating them. With both wythes acting together, a behavior closer to what could be assumed of the panel’s full thickness is realized, resulting in a more efficient use of concrete. This efficiency can allow for a more economical and more efficient use of materials. Figure 1 shows typical designs for a 32-foot panel with a typical 90 mph wind, exposure C. In other words, a common warehouse panel. As shown above, partially composite panels reduce the amount of concrete required in a wall panel, creating a cost savings. The potential exists for these lighter-weight panels to be well-suited for seismic areas by reducing a building’s wall mass. They may even provide some dampening or energy absorption when used in shear wall applications. The lighter panels can also help reduce construction costs (since they can be manipulated by a smaller crane) and can extend tilt-up construction to even taller panels than currently possible by increasing the effective depth without increasing the amount of concrete. 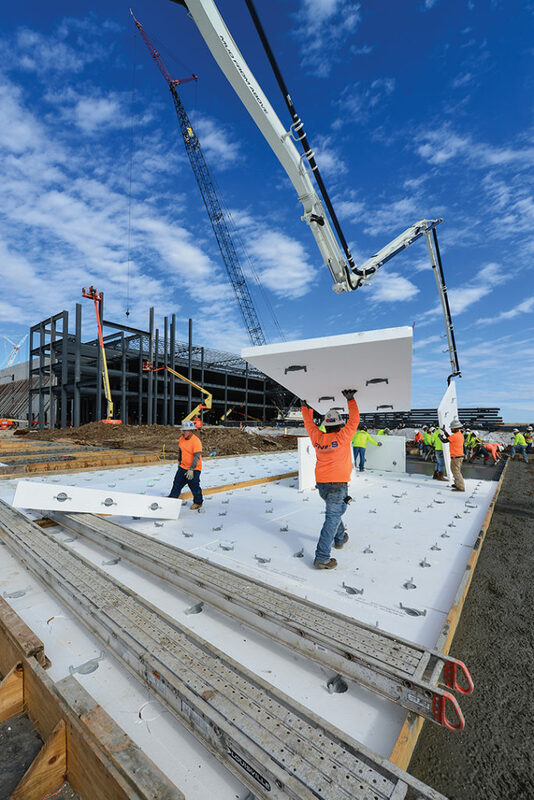 Nearly 180 million square feet of tilt-up panel was constructed in 2017 and less than 10 percent of tilt-up buildings utilize some type of insulated sandwich panel construction (composite or non-composite). 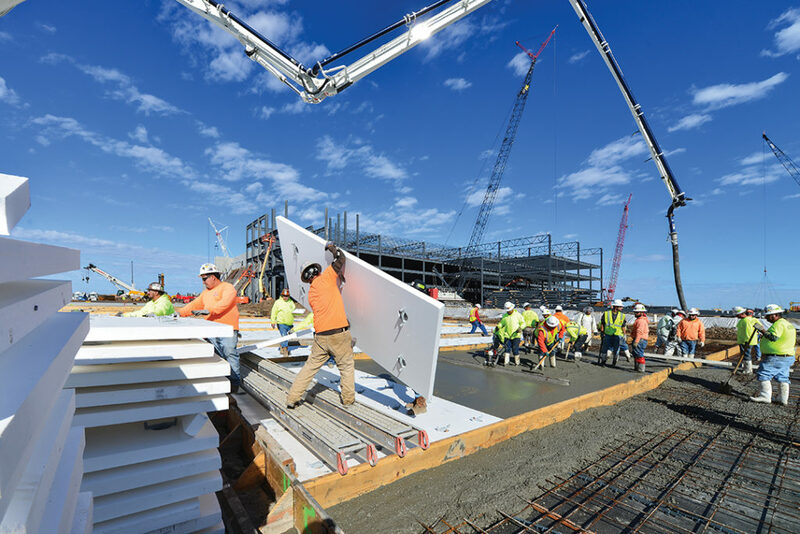 Insulated concrete wall panels delivered by the precast industry (through plant manufacturing) are usually designed under the assumption that they have a high percentage of composite action that approaches the density of a completely thick wall panel. The percentage of insulated wall panels in the tilt-up industry that use partially composite action for design is far lower. A very small portion, less than 5 percent, of all insulated tilt-up is partially composite. Our task group estimates this could grow to more than 50 percent once the technology is mainstream. The height of these panels will also potentially be impacted by this research. 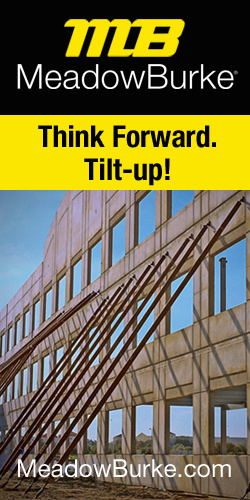 The current average height of partially composite tilt-up panels is around 35 feet. This number could grow dramatically with the support of more research and accessible design methodologies. As mentioned previously, the market for insulated wall panels should see tremendous growth as changes to the energy code are enforced. Without getting into the minutia of the application of the International Energy Conservation Code, more than 98 percent of all building walls are required to have a minimum R-value of 5.7 or greater. R-values this low are only for climate zones 1 & 2, which accounts for only the very bottom coastal stretch across the U.S. and Hawaii. All other climates continue to increase from there. The state of Texas, which is the largest tilt-up market at present, has continuous R-value requirements for all buildings of 5.7, 7.5 and 9.5, working south to north with no portion of the market exempt from continuous insulation for climatic reasons. Therefore, the application of insulated sandwich panels to the tilt-up industry has a virtually unlimited volume potential. With regard to building types, tilt-up construction is already employed regularly across the country for multistory office buildings, distribution centers, schools, libraries, retail centers, industrial facilities, government buildings, and more. Support of tilt-up industry innovation has a broad and diverse impact. While there are things we do not know about partially composite insulated sandwich panels, there has been good work done in the past. The Precast Institute’s Committee on Precast Sandwich Wall Panels publishes a report titled, “State of the Art of Precast/Prestressed Concrete Sandwich Wall Panels.” This report contains a wealth of information related to sandwich wall panel history, application, design, detailing considerations, insulation performance, stressing, erection, and bracing. The report stops short of providing any sort of universal design methodology. Currently, each manufacturer of composite panel connectors utilizes a proprietary design methodology – similar to that of an engineered wood truss or precast wall panel – to deliver an engineered product. The issue with this approach in the tilt-up industry is that the manufacturer of the connectors is not the engineer of record for the panel. Another consideration is that the engineers are not in control of the manufacturing in the way they are with the precast industry. The reality of competitive bidding production labor and responsibility for panel construction increases the separation of design and construction. 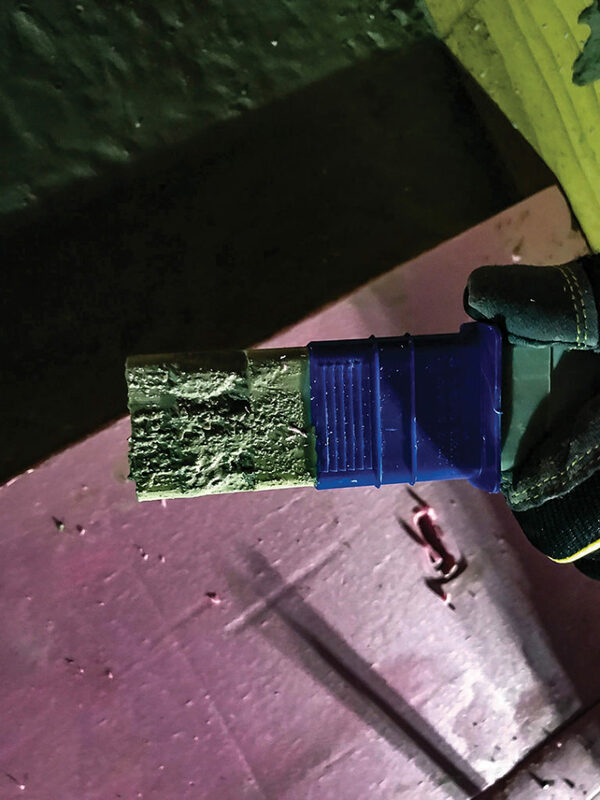 Additionally, unlike an engineered wood truss where each element has well-defined and documented properties, there are unknowns, or, at a minimum, discrepancies associated with the connectors in partially composite insulated concrete panels. As mentioned previously, this is problematic for engineers of tilt-up structures who want a better understanding of the behavior and design methodologies of these systems. This request from the engineering community for more research and transparency, while it does address a potential liability issue, stems from their responsibility as licensed professionals. Therefore, due to the market reality preventing a responsible, single source for the insulation system design and panel construction (similar to that which exists in the production of a wood truss or precast panel), the traditional design and construction relationship is an essential delivery vehicle. It is the intent of the TCA Engineering Task Group on Partially Composite Sandwich Panels to work within the established framework of ACI 318 and to go through the approval processes of the International Code Council and the American Society for Testing and Materials to promote universal testing and design methodologies that may lead to code recognition or modification. The ease with which these systems can be incorporated into a project’s design without special circumstances or considerations is critical to its scale of impact. To do so, corroborated design compatibility with, and possible acceptance from, such codes is precisely what is needed for design engineers to fully realize their potential without undue effort or risk. The goal is to make this promising technology mainstream by eliminating barriers created by proprietary practice, limited tilt-up-industry-specific research, and a lack of standard testing, and also by allowing the tilt-up engineering community full access to knowledge of the behavior, performance and global predictability of partially composite insulated sandwich panels. Accomplishing this will provide owners with a high-performance, yet economical, means to comply with changing energy codes, in line with everything they have come to expect from quality concrete wall panel construction. It is a win for the concrete industry, the engineering community, the environment and consumers.